Toot Sweet Ink, 9780991266777, 312pp. The young woman samurai. The ambitious warlord who loves her. His beautiful sister who challenges her. And the assassin determined to kill her. Yamabuki, a warlord's daughter trained as a samurai, is shadowed by a lapsed priest turned shinobi who vows to avenge the man whom she killed--his lover and teacher. She is seduced by the handsome and ambitious warlord, Kiso Yoshinaka, whose aim it is to rule all of Japan. And before she knows it, she's drawn into events far bigger than she ever imagined, and must question her loyalties. Yamabuki balances giri, duty to her clan, against ninjo, human feelings--her passion for the charismatic warlord--and it doesn't get easier when Tomoe Gozen comes on the scene to tip the scales in the decision. Action-filled with pitched battles and adventure depicting the samurai life as it was in ancient Japan. 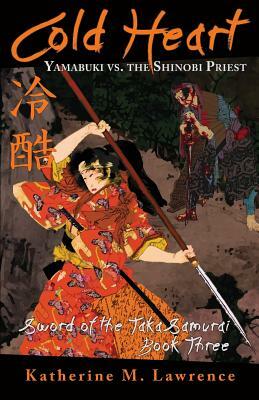 The adventures of Yamabuki continue in this full-length 83,000-word novel, Book Three of Sword of the Taka Samurai.